Q 1: The mention of moral (non-material) violations that corrupt or invalidate the fast as is mentioned in the definition of fasting which include sins such as backbiting and tale-carrying – The fact that moral violations are mentioned in the definition of fasting, does that that mean that the fast is invalidated by them? A: These are moral violations meaning that they reduce the reward of the fast – or they can completely invalidate the fast so that there is no reward for the one fasting. So these [sins] are violations in meaning. They reduce the reward, or nullify the reward. So this is a moral violation. As for physical violations (eating, drinking, etc), then they invalidate the fast, and one is obligated to make it up [with qadā]. As for moral violations (lying, backbiting, tale-carrying etc) that invalidate the fast, then one does not make up the day because he did actually fast. 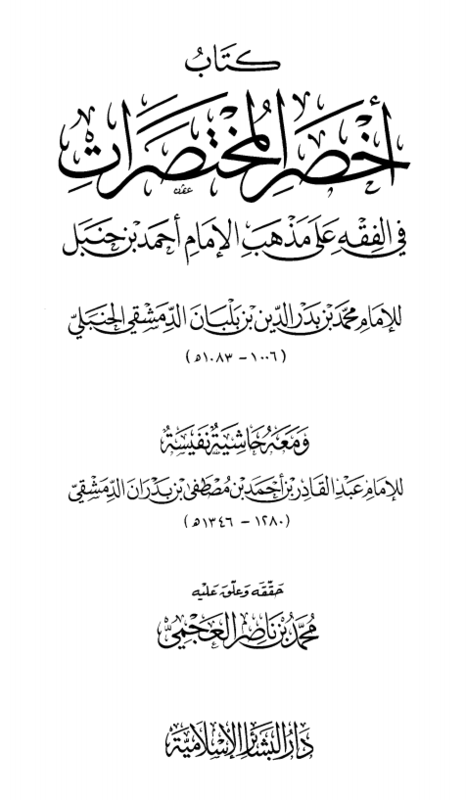 Q 2: In the book, kashf al-Mukhadarāt li Sharhi Akhsar al-Mukhtasarāt it states: “If a traveller knows that he is to arrive home tomorrow, then it is cited textually that he must fast.” Is this saying correct? A: Yes, this will be discussed later. If he knows that he will be home tomorrow then it is upon him to fast because the following day will not be a whole day of travelling – he will not be a traveller for the whole day. So he is obligated to fast. As for his saying: “then it is cited textually”, then textually means from Imām Ahmad so when it is said “textually” here, then it means it from Imām Ahmad (rahimahullāh). Q 3: The one who took a vow (nadhr) to fast every Monday and Thursday, then he was unable to do so – does he have to expiate just once for breaking the oath, or for every Monday and Thursday? Q 4: A person fasts the optional fast: a day fasting and leaves the next day and fasts the day after that, and again leaves the day after, and he continues like this. So his fast will coincide with Friday or Saturday. So is it allowed to fast either of them on their own? A: Yes, if this fasting is from his habit, that he fasts the fasting of Dawūd (‘alaihis-salām), then he can continue with it, even if it happens to be on a Friday or a Saturday. As for Saturday then there is no sound evidence that prevents one from fasting it on its own. As for Friday, then there is evidence forbidding fasting it on its own – but that is only if it is singled out and fasted upon. But here that is not the case, rather this is a continual fast of one day on and one day off. Q 5: If one travelled during the daytime in Ramadān and he knows that he will reach his destination before the sun sets, what is better for such a person? A: What is better for him and safer is that he fasts. If his journey is by an easy means of travel such as an airplane, then it is better that he fasts. Q 6: If a child fasts the day, and then he attains puberty in the middle of that day. Does he have to make up that day, or is that obligatory fast counted and rewarded for him? A: If the excuse that allows one not to fast is removed, then he withholds for the rest of the day and he makes up that day. And from that category is the child who becomes an adult in the day. A: As for the five daily prayers, then they are witnessed and seen by the viewing of the sun – when it reaches midday, it is seen; when it sets in the evening, it is witnessed. When the twilight-redness disappears, it is witnessed by sight obligating the Ishā prayer; when Fajr appears, it is witnessed. These are all matters seen and witnessed. They do not require calculations, except in situations or locations where it cannot be witnessed and seen, when the sun is concealed. So these timetables are a sign or an indication of the entry times of the prayers. Q 8: For those people living in places where the Sun does not set. Are they to resort to calculations? And how are they to pray? Are they to pray in accordance to the times of prayer of the land closest to them? A: The case of these people has been put to the Committee of Major Scholars and an edict was issued with respect to them. So if they experience within 24 hours, night and day [visibly], then they can eat and drink in the night, and they must fast in the day. So if they have in a 24 hour period both night and day, then they must fast, even if it is a short time-period. They are to fast in the day, and break their fast in the night. However, if within a 24 hour period, they do not have a night and day passing through it, then they must rely on the timings of the closest land to them that has a distinct day and night within a 24 hour period – and they are to follow them [in prayers and fasting]. And they are to follow the timings of that land in their fasting and their breaking of the fast – i.e. follow the timings of the land closest to them that experiences both night and day within a 24 hour period. Q 9: What is the meaning of the hadeeth of the Prophet (ﷺ): “We are an ummah [wherein many] do not read or write, so the month can be 29 and can be 30 days.” Can it be understood from this narration that one can refer to calculations for determining the start of months? A: No. What is understood from this hadeeth is that the month can sometimes be 29 days and sometimes 30 days when seeking out the new moon of the month. Q 10: If a person fasts the optional fasts but during the day he forgets and eats or drinks something. Is his fast still valid? Q 11: The six days of the optional fasts in Shawwāl and the fast on the day of Arafah, do they require an intention to be made from the night before? A: No. Optional fasts, all of them, they do not require an intention from the night before – with the condition that one has not eaten or drunk or participated in anything that would nullify a fast from the beginning of Fajr till he intends to fast the optional fast. Q 12: The one who is incapable of fasting and he does not have wealth to feed a poor person for each fast missed with the prescribed fidyah. What is upon him? A: It remains a responsibility upon him to discharge. An expiation is a debt that must be paid – so even if someone else pays it on his behalf as an act of generosity or that a guardian pays it their behalf, then it is considered as paid and discharged. Q 13: If a trustworthy person sights the moon in Saudi Arabia, is fasting therefore obligatory upon the people of Yemen, Kuwait and Bahrain or are they to look to the differences that occur in the rising of the moon in the different regions/lands of the earth. A: Yes one pays attention to and looks to the differences that occur in the rising of moon in the different lands. So if the lands share the same rising of the moon due to their proximity, then they are obligated to fast together on the same sighting. However if the moon-rising differs between the lands, then each lands seeks out its own sighting. Q 14: As it relates to the new moon for the beginning of month of Dhil-Hijjah and the standing at ‘Arafah in that month, does one still look towards the differences in the rising of the moon between the lands? A: Yes. Likewise for the fast of day of ‘Arafah (for those not at Hajj). As for the standing at Arafah, in that there is no differing because that is upon the sighting of the Kingdom of Saudi Arabia. One is to act upon the sighting of Saudi Arabia. That is because those performing Hajj follow the sighting here in Saudi Arabia. So if the sighting of the new moon is confirmed in Saudi Arabia, then that is followed for those making Hajj and for those standing at Arafah with the rest of the Muslims. However, if the intent is the other regions of the earth and how they are to fast the day of Arafah? Are they to fast based upon the sighting in Saudi Arabia? We say: No , they are to fast based upon their own sighting. Q 15: The one who leaves for open country or the wilderness for a picnic or a visit, and his journey falls short of 80km, does he still shorten his prayer? Q 16: In these times there is no abandoned spoils or war booty, so can the household of the Prophet (ﷺ) receive Zakāt instead? Q 17: The one who abandoned fasting in Ramadān for many many years, and he doesn’t know the number of Ramadans he missed, then he repents for that. What is now upon him? A: If it is not possible to ascertain the number of missed fasts, then repentance suffices him. If he is not able to estimate the number, or make a reasoned judgement then the repentance is sufficient. However, if he is able to estimate the number he’s missed upon what is most probable, then making those fast up based upon that estimate would be sufficient alongside feeding a poor person for each day missed. Q 18: Is it correct for a person to fast the whole of Ramadān based upon a single intention? A: No. Each day is a distinct act of worship so the intention is made before Fajr for each day. The meaning of intention is that you intended to fast that day. By virtue of you taking the pre-dawn meal (suhoor), this proves that you’ve made an intention [for that day]. The place of the intention is in the heart so if you got up for suhoor or sat to eat the suhoor, then that is proof that you had an intent [to fast]. Q 19: Do the fasts of expiation (kaffārah) necessitate an intention from the previous night? A: Yes. The intention from the night before is required for every obligatory fast, whether it be a fast that is an origin from the Sharee’ah [such as fasting Ramadān] or whether it be a vow, etc. They all require an intention from the night before. Q 20: If a person travels in the month of Ramadān so as to take advantage of the allowances (the rukhus) so he can eat and drink, is that allowed for him? A: No. If he travelled so he could break his fast in Ramadān or for the purpose of shortening the prayer, that is not allowed for him to do, because this is trickery and deception so as to avoid the obligations, so it is not allowed. Q 21: The one who intends to travel, then is it obligatory upon him to withhold from breaking his fast until he has left the town? A: Yes. So long as he remains in the town, he has not travelled, he is a resident. So when he leaves the town, he has began his journey. Q 22: What is the ruling of giving one’s zakāt to one’s paternal uncles? Q 23: A person upon whom fasting is obligatory who finds that it is a day of fasting – then he is obligated to fast for the rest of that day and withhold, and then to make up that day as well. So he has been obligated to fast that day and then another day. How can we obligate that upon him, when the only thing obligatory him is just one day of fasting? A: What is obligatory upon him is just one day of fasting, and that is the qadā he makes up for that day. As for the rest of that first day he fasted, then that was as a sign of respect for the day of fasting, in reverence of it. The people are all fasting, and you are eating? The people may think you are a traveller. What is better is that you withhold along with the people. Q 23: The person who is unconscious for a long time – is he to make up (qadā)? A: Yes. If the time period is short, three days for example, then he makes up those days. He makes up the fasts and the prayers. If the time of unconsciousness is long, due to an accident, such that he bereft of his senses, in a coma, then the obligations are lifted from him, and he begins his obligations from new – if Allah brings him cure, he starts his obligations from new. Q 24: The one who is unconscious for the whole day or one who falls into insanity for the whole day in Ramadān – is that the same as the one who sleeps through the whole day? A: No. The sleeping person’s senses remain intact. He is not like the insane or the unconscious person. The sleeping person’s intention remains intact. He is not like the one who falls unconscious, because the unconscious one does not have his senses. Q 25: What is the ruling upon singling out Friday for giving in sadaqah? Q 26: If none of the men have seen the new moon for the start of the month of Ramadān, but a woman did see it, is the sighting of a just one woman sufficient? Is it taken? A: Yes, it is taken. The sighting of one woman who is trustworthy is accepted. This is something stated by the scholars and jurists. No. 1201. Al-Albānī declared it to be saheeh.